Louis Koo Tin-Lok (古天樂) hit two red carpets with Gigi Leung Wing-Kei (梁詠琪) in the same evening: one for the 2014 Hong Kong International Film Festival (HKIFF) Opening Ceremony, and the other for the world premiere of Pang Ho-Cheung’s “Aberdeen.” Koo and Leung play husband and wife in the film, as well as parents to their only child, a daughter named Chloe (Lee Man Kwai, who also hit the red carpets with her film parents at both events on Mar. 24). Koo has gone above and beyond in his role as this year’s HKIFF Ambassador, seemingly cloning himself to make all sorts of appearances thanks to new film releases and press conferences. Earlier in the day, he attended a press conference for the upcoming summer action film “Z Storm,” and 24 hours later, the visibly tired actor appeared at another for “Overheard 3” with co-stars Zhou Xun and Lau Ching-Wan. In addition to “Aberdeen,” Koo’s film “The White Storm” also screened at the HKIFF. There was no escaping Koo – Hong Kong’s highest-paid entertainer in 2013 – in 2-D format either. 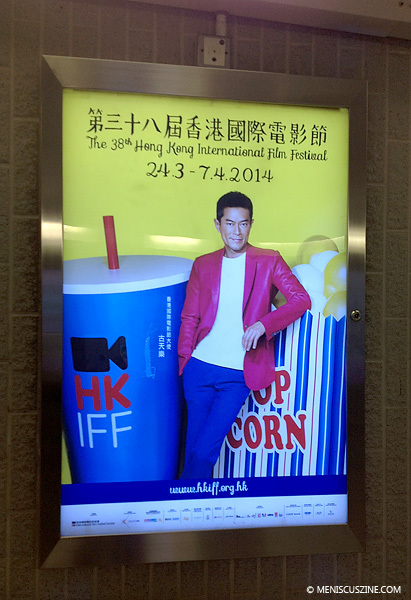 One trade magazine advertisement for Universe Films featured Koo in three of its four promoted movies, and posters promoting Koo’s ambassadorial role for the HKIFF were displayed all over the city.